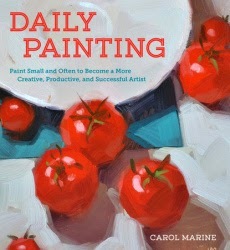 Creative people run the gamut from the crafty hobbyist to the accomplished artists, yet they all could benefit from the simple, practical advice of a pro as explained in Carol Marine's new book, Daily Painting: Paint Small and Often to Become a More Creative, Productive, and Successful Artist. As intuitive as it seems, we all need reminded from time to time that there is no secret recipe for improvement - sometimes, you just need to dive in and stick with it. Don't be fooled by the title; there's so much more to this book then just a call to paint more often. In 2006, Marine discovered the daily painting movement that encouraged artists to paint one small painting daily and sell that work online. Unencumbered by perfectionism or preconceived notions about the right or wrong way to paint, frequent studio time leads to small completed works. Finishing a project can clear your mind for the next project; you get a sense of satisfaction with the daily completion - and results in hand. Marine saw her skills and enjoyment of her craft improve dramatically and I believe anyone would! It is, after all, the practice that raises a novice to a pro. So, what to do with all these small paintings? Put them in the hands of the public by selling them online. Marine even addresses blogging as a tool to market your art and sell those daily masterpieces. Helpful insight into the process of creating an online presence is straightforward and easy to follow with clear descriptions of the benefit of such an endeavor. Daily Painting contains much of the technical side of painting and drawing that you'd find in any painting book: supplies, color theory, proportions. Beginners would feel right at home following the creative process of the artist. What I really loved most, however, was the number of fine paintings used throughout to illustrate or just for the love of painting. Carol Marine practices what she preaches with beautiful results. If you're considering purchasing some of her work - I'd start with this book. A small painting is similar to flash fiction perhaps? Janie, I told you - no flashing. Absolutely none. Actually, I'm not familiar with flash fiction, but I do know that sometimes a large work is fun at first....but you may have to put 30-40 hours in to it and lose your love along the way...you feel like you have to finish...one before you start another. Then it's a drag. That makes a lot of sense and could also make a lot of dollars. People tend to hold back and avoid trying something new because they fear failure. As I learned in seminars, failure only comes to those who stop trying. I can understand that challenging yourself to produce one finished painting per day gives you a daily dose of satisfaction and a sense of completion, boosts your confidence and improves your technique. Carol's advice can be applied to just about anything from exercise programs to cooking to public speaking - anything you wish to learn and master. Thank you for the book review, Cherdo. I'm off then. Please take good care of yourself and keep an eye on problem child Janie for me. God willing I will be back next Wednesday. It might be later than usual because our flight home from the Carolinas lands late in the evening and it's an hour drive home from the airport. I will probably be groggy when I stop in to see you Wednesday morning. Goodbye for now, dear friend. Stay safe and have a happy weekend! Take care, dear friend! I hope it is a fruitful trip and tell Mrs. Shady I'm saying a prayer for her to find a perfect match with her personality, qualifications and needs! Do not, under any circumstances, go into the cockpit. You cannot fly the plane regardless of what anyone tells you - even if you put your mind to it - you can't (on this trip). Also, crying and whining will get you nowhere. If you want the junior pilot's wings you'll have to sit in your seat like a big boy and ask nicely. Stay away from the beverage cart with the little bottles. Those are not for kids; they're for adults that don't like their body organs - specifically, their liver - and they can't wait for Mother Nature to take her toll on it, so they speed it along with CnH2n+10H. See? You don't really want to drink CnH2n+10H. You're a big boy. Do something fun while you're gone, too. Don't make it all work and no play. Everyone can use a break. And Janie and I have our hands in something on Monday! You'll have to wait till you get back to see....shhhh...it's a secret. Problem child Janie my blooming a#@! I expect this comment by Janie Junebug to be removed by the time I get back. What a wonderful idea. I'm a very creative person, but tell myself I "don't have time to paint." I'm going to check this book out and try it. Thanks Cheryl! Totally great advice from this author! I had the same response - what a great idea and why do I need someone else to tell me? Small paintings - brilliant! I always tell the art kids that for every rule you learn in art, there's someone who got famous for breaking it. Sounds terrific! For me, oil painting is usually such a major undertaking, I tend to put it off, because I "don't have time" to mess with it. Years ago, I did a series of small paintings easily completed in a day, (or two) but darned if I hadn't forgotten how much fun that was until I read your post. Thanks for the reminder. I'm glad you're enjoying Blogging for Books. Totally enjoy Blogging for Books; it's especially nice that I get to choose the book. I've only had one that was "bleh" so far! Missed you, Allie-Millie! I visited your site and didn't see an update - hope that is because you're doing something fun! This sounds like a great book. I totally agree that the best way to become better at anything is to do it over and over again on a regular basis. Thanks for sharing! Great advice for any creative endeavor. I try to write everyday. I hope to eventually get good at it. I could do with a project like this. I'd definitely fall into the beginner category. I've been keen to learn more about art for a while. Getting your hands dirty with the paint seems like a good way to start. Nice post with wonderful information. Thanks for sharing. Great information. I'm doing some research on painting. I love DIY projects very much but I'm not good at painting. So the book will be useful. Thanks for share it with us. I was watching a number of the blog articles on your website, I like your way of blogging. Hope you will be the better articles in the near future. Paint small and often to become a more creative, productive, and successful artist review. Thanks for sharing this wonderful post. It's seems like a great blog i have ever seen.